October 4 is National Vodka Day! It’s also National Taco Day, but you won’t lose if you choose the booze. Really, there’s room for both around the dining room table! Vodka comes from the Slavic word voda, which means “water.” Appropriate, given that many dismiss vodka for its lack of flavor. True, it doesn’t taste like a Christmas tree like some alcoholic beverages we know (I’m talking to you, gin! ), but it sure does pack a punch. And really, isn’t that the point of a good spirit?! By definition, vodka is a combination of mostly water and ethanol, so if you’re out drinking in the middle of nowhere and run out of gas, fear not! Chances are good you’ll still make it home without having to call AAA. There is some debate over the origin of vodka, with both Poland and Russia laying claim to its invention. The word first appeared in writing in a Polish court document in 1405, but Russians claim to have been distilling vodka since the 9th century. Not to be outdone, the Poles say they were producing vodka in the 8th century; this was called gorzalka and was used for medicinal purposes. Which just goes to show that getting sick back in the dark ages wasn’t an entirely unpleasant experience. Both Russia and Poland have named vodka as their national drink, so it appears even centuries later this alcoholic cold war rages on with no clear winner. Regardless of who actually invented vodka, it is one of the most popular alcoholic beverages around the world, praised for its universal ability to be used as a base for mixed drinks and cocktails. Or, you know, guzzled straight from the bottle if that’s your preference. We won’t judge! Vodka is usually made from either fermented cereal grains or potatoes, and in recent years, a wide variety of flavored vodkas have popped up. These range from the simple (cranberry, grapefruit, blueberry) to the unusual (whipped cream, cucumber, cola) to the what-were-they-thinking?! (gummy bear, peanut butter and jelly, bacon). It seems like everybody is trying to outdo everybody else in the crazy flavor department. After being diagnosed with diabetes, I was in search of “healthy” cocktails, and discovered a simple vodka and soda isn’t too terribly bad, relatively speaking. It’s got no sugar or carbs and only 96 calories per 1.5 mL, the standard “pour.” Unfortunately, it doesn’t have much flavor, either. But last year I discovered a local Portland vodka distiller named Wild Roots. Their vodkas are infused with flavor, and they have some rather delicious varieties available. Their Northwest Red Raspberry infused vodka is my favorite, and this evening, that’s how I chose to celebrate the holiday. On the rocks with a splash of club soda, though really, this one is perfectly drinkable straight up. The food of honor today is very filling, but you’ll still Polish off your plate. October 8 is National Pierogi Day! It’s also National Fluffernutter Day, and while that’s a fun word to say out loud – go ahead, do it – the combination of peanut butter and marshmallow creme is much too sweet for my palate. I’d prefer to honor my heritage (Eastern European) instead, so we decided to celebrate the lowly pierogi. I say lowly because the pierogi – a dumpling traditionally stuffed with mashed potatoes, sauerkraut, ground meat, cheese, or fruit, that is first boiled and then either fried or baked – was long considered a peasant dish. 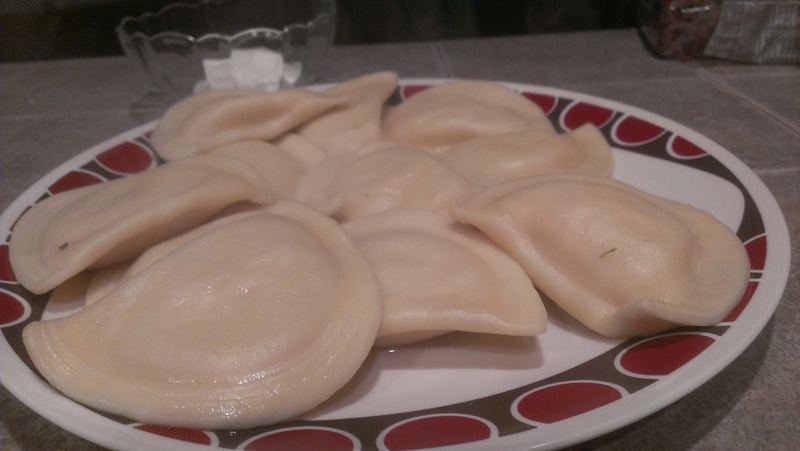 Similar to Russian pelmini, pierogi (also known as perogi, pyrogy, perogie, perogy, pirohi, piroghi, pirogi, pirogen, pierogy,pirohy, pyrogie, and pyrohy) originated in Poland in the 13th century as an answer to Italy’s ravioli, and were popular with Poles, Czechs, Slovaks, Russians, and Ukrainians. Eastern European immigrants in the late 19th century brought their favorite pierogi recipes to America, and remain especially popular in the Northeastern states. They became a staple of ethnic church fundraisers following World War II, and began appearing in the frozen food aisles of supermarkets in the 1960s. To this day, the Pittsburgh Pirates feature a costumed Great Pierogi Race during all home games featuring contestants dressed in pierogi costumes: Jalapeño Hannah, Cheese Chester, Sauerkraut Saul, and Oliver Onion. Seriously, folks. I am not making this up. Pierogi are easy to come by around here, as there is a large local Eastern European population in and around the Portland metropolitan area. But since our neighborhood European market was closed when we stopped by, we ended up picking up a box of frozen Mrs. T’s. Potato and cheddar pierogies, to be exact. They made a tasty appetizer for tonight’s dinner. Here’s the truth, the hole truth, and nothing but the truth: today is National Bagels and Lox Day. I was pretty excited for this holiday. 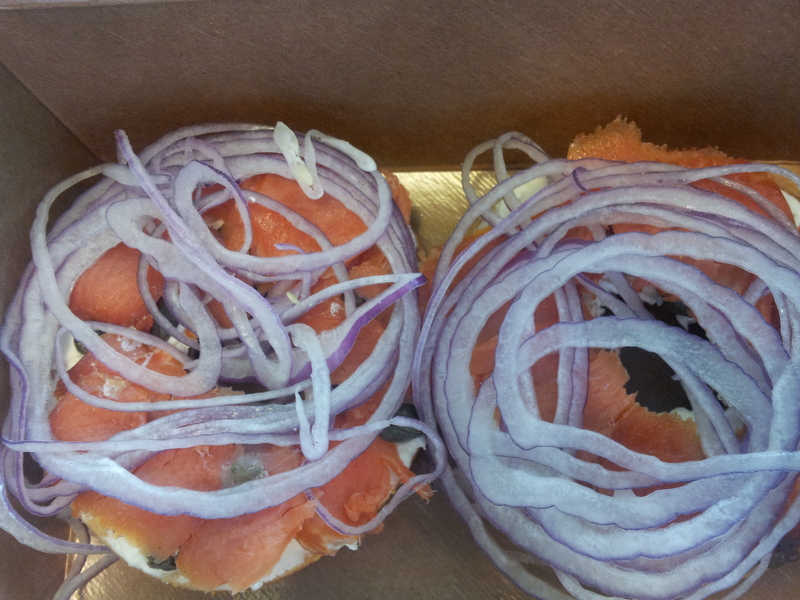 I love bagels – they’re in my Top 2 list of favorite foods with a hole in the center – but had never tried one with lox. In fact, I wasn’t completely sure what lox even is. Some kind of fish, I knew that much. Turns out it’s thinly sliced smoked salmon – yum! My favorite fish. Living in the Pacific Northwest, it’s basically a prerequisite that you like salmon. Apparently Tara didn’t get the memo (ahem), but we decided to let her in anyway. Bagels and lox traditionally consists of a bagel, cream cheese, salmon, and sliced red onion. Other ingredients such as capers, dill, and chives may be added. Bagels originated in Poland in the 16th century. They were a nod to the bublik, another circular bread with a big hole in the middle. Why the world needed two such similar foods is anybody’s guess, but then again, Ding Dongs and Ring Dings have coexisted peacefully for decades, so why not? Polish Jews immigrating to the United States brought along bagels, which is why they’re such a staple in New York City (which still makes the best in the country, in my opinion). Bagels caught on everywhere in the 1960s, when bagel bakers Harry and Murray Lender teamed with Florence Sender (they went on a real bender!) to mass produce and distribute frozen, pre-sliced bagels. Lox have been around for thousands of years, swimming around contentedly in oceans and rivers. For our bagels and lox, we headed to New Season’s Market, a local grocery store that advertises the delicacy. They served theirs with cream cheese, lox, red onions, and capers. I have to say, I was blown away, and declared this my favorite food challenge yet. The salty, smoked salmon perfectly contrasted the sweetness of the cream cheese, while the thinly sliced red onion added subtle crunch and the capers, a tart bite. I loved the bagels and lox, and will order this one again soon! A little heavy on the red onion, but oh so good!